Exceptional value. Only have one chair put together (because there's still snow on the patio/deck, but the quality is great. 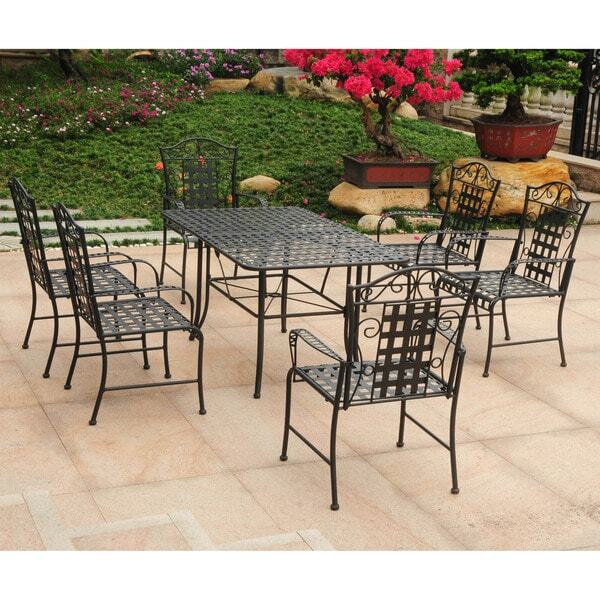 It is sturdy and stylish, blending well with existing iron furniture we have. Friends will ask, and we will tell them where to find the International Caravan Mandalay Iron furniture on Overstock.com. Add a touch of elegance to your outdoor furnishings with this dining set. This set is avaialble in four stunning color variations, built with durable, heavy duty electrophoretically treated iron, and features a lovely 'Mandalay' wrought iron style. Great set for the price. I had been searching for a black iron table that seats 6 for the right price for months. Most looked too cheesy, this one is great quality. This set was very easy to put together. However, I was surprised that there were areas that rusted in the first rain. Happy I bought a cover but may need to get some spray paint to seal it better. The construction of the International Caravan Mandalay Iron Rectangular Dining Set is high quality, but it unfortunately rusted very quickly. If purchased, I would recommend adding a clear coat immediately. We have been delighted with this set. It is quite heavy duty, and has a very nice Bronze/Brown finish, and should hold up great. Unlike some other sets, the seats are large and substantial. It is even more attractive once adding some pretty cushions. Very pleased with this purchase. This is a nice set. It was easy to assemble and makes a nice addition to my outdoor dining space. The table isn’t s substantial as I was hoping, but I’m intending to get tempered glass to put on top of the table, which I’m hoping will increase its stability. Table looks great on my deck. It's just the perfect size for our meals. Lighter weight than I expected. Easy to assemble. Because of the support bar, it's difficult to push the chairs close to the table. I keep hitting my knees on the bar. The chairs are extremely roomy and comfortable. This item was easy to assemble and from afar it looks attractive. However; it started to show signs of rusting, in various areas shortly after assembly. Additionally the lattice design in the chair arms is very easily bent, and actually some of them arrived bent. The upside, there is one, is the fact that you can bend it back easily by hand. However, this repeatedly being done will surely shorten the lifespan of the item. Really well made - comfortable chairs - easy to put together!!! Perfect for our deck! Cheap looking and very light. I returned it. The customer service representative was very helpful and got it picked iPrint at my door by UPS. Always easy returns. Very nice overall! Good size, weight, strength--nice product for the money! "Are the chairs metal as well ?" Yes, they are. But after arrival, before the first rain over them is better to be repainted (chairs and table) to last longer without rust. (10 spray tubes from Lowes). Overall I like them. "Is there a hole for an umbrella?" Yes there is a hole for an umbrella! "How heavy is this set? I live in an area that has a constant breeze and don't want something that will blow around like aluminum chairs do. " We purchased this set last fall and have not seen them move due to wind. New England can have some crazy weather and this set has held up well. Yes, the chairs can stack. "What is the size of the seat (front to back & side to side)? Beth"
The seat is 20 inches wide x 19 inches deep. "Do you sell the chairs separately?" You can refer to item number 18790796 for the chairs. "what is the weight limit for the chairs"